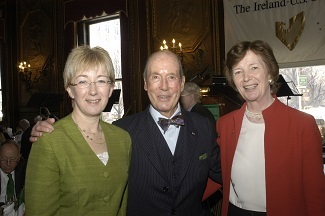 Ambassador Walter Curley at the Council's 2005 St. Patrick's Day lunch in New York with two Mary's - Mary Hanafin, who at that time was Ireland's Minister for Education & Science and Mary Robinson, former President of Ireland. Ambassador Curley was among the earliest supporters of the Ireland-U.S. Council and was a distinguished American who had served as Ambassador of the United States to Ireland and to France. In 2005, then-Council President Michael J. Gibbons hosted a Lecture & Reception in New York’s River Club to mark the publication of Ambassador Curley’s excellent book “Vanishing Kingdoms – The Irish Chiefs & Their Families” at which members and friends of the Council heard most interesting remarks from the author. In World War II, Ambassador Curley served as a Marine Corps infantry combat officer, served in the Iwo Jima, Okinawa, Guam and North China campaigns. He was awarded decorations by the Army, Navy, Marine Corps, and The Republic of China. After the war, he worked in India and Italy with the Caltex Oil Company from 1949 until 1959. He became a partner in J.H. Whitney & Co, the venture capital firm where he worked until 1974. He served as Commissioner of Public Events and was Chief of Protocol of New York City in the administration of Mayor John Lindsay. He was appointed Ambassador to Ireland by President Ford in 1975. He returned to the private sector to establish his own venture capital investment firm in New York in 1977. He served as Ambassador to France (1989-93) under President George H.W. Bush. He was a Trustee of the New York Public Library, Miss Porter's School, Brooks School in Massachusetts, The Buckley School, Barnard College, and a former director of the New York Life Insurance Company, Fiduciary Trust International, Bank of Ireland, Crane Co., Guinness Peat Aviation (U.S), Independent Newspapers Ltd. (Dublin), Fairchild Camera and Instrument Co., American Exploration Co., The New Yorker Magazine, the International Board of Banque Paribas, and Sotheby's Holdings, Inc. He is the author of four books: Almost a Century - An American Life East & West of Suez, Vanishing Kingdoms, Monarchs in Waiting, and Letters from the Pacific. He is survived by his wife of 67 years, the former Mary Taylor Walton of Pittsburgh.